My grandmother dies in the middle of the night. My mother said her blood turned septic, and it was quick. Later I will google what that means. Dangerously low blood pressure, the result of a severe infection that has spread through the bloodstream. S goes out to buy muffins. I stay home and make coffee. We write a song using chords I can barely play. Except the chorus is easy, so I help. The chorus is this: D A Em G and it is a chord progression I have been playing for years. Since I first learned to play the guitar (poorly) this is the chord progression I play when I pick one up. This is the chord progression I dedicate to my grandmother, who spent the last years of her life in a nursing home, sometimes not knowing who we were. The last memory I have of my grandmother before the nursing home: I pick her up. She asks me to take her to Walgreens. She loves going to Walgreens. She has the beginnings of dementia coupled with a tendency to hoard and a confused sense of kleptomania. My grandmother has worn lipstick for years. She buys the kind that is green in the tube and then red when you put it on. That day, in Walgreens, she pushes a cart around the store. I watch her take a tube of lipstick from a shelf and put it into her purse. 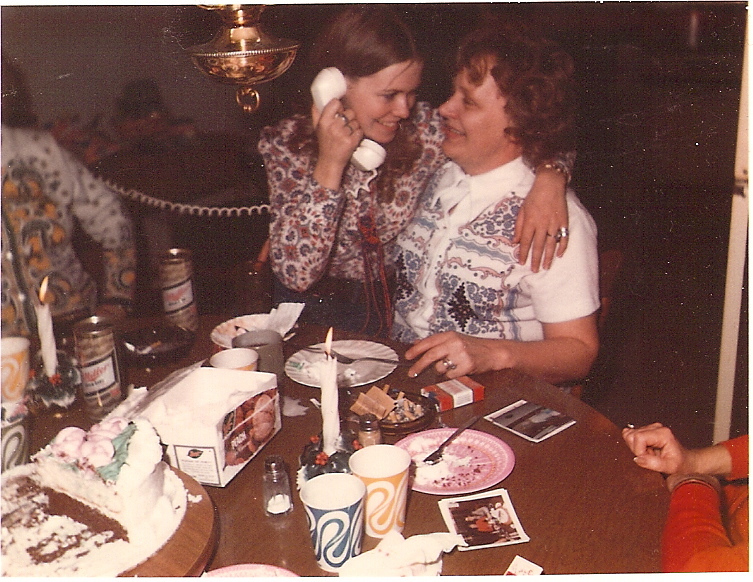 My favorite picture of my grandmother is her and my mother on my mother’s 21st birthday. My mother is sitting on my grandmother’s lap. My mother holds a phone up to her ear. They’re smiling at each other. In the car I ask her where the lipstick came from. She doesn’t know. And it’s the truth. She really doesn’t know. The thing about grandparents: they are always there. They are there when you are born. They are there for every birthday. They give you Hallmark greeting cards with twenty dollar bills crisp and new from the bank. Snickers bars chilled in the fridge. Altoid containers hidden in every drawer in the house. They are always always there, until they’re not. This entry was posted in Journal, Writing and tagged death, diary, grandparents, loss, mourning. Bookmark the permalink. ← the give & the take.